To Cite: Niazi K, Khaled J M A, Kandeal S A, Khalel A S. Assessment Techniques to Detect Aspergillus fumigatus in Different Samples of Immunosuppressed Male Western Albino Rats, Jundishapur J Microbiol. 2014 ; 7(11):e11974. doi: 10.5812/jjm.11974. Background: There are several conventional, immunological and molecular techniques to diagnose the fungi that cause aspergillosis in biological samples; these methods have some advantages and disadvantages. Objectives: The current study aimed to evaluate different methods used in identification and diagnosis of fungi causing aspergillosis. Materials and Methods: Male Western Albino rats were provided by Animal Care Unit at Faculty of Pharmacy, King Saud University. After adaptation for a reasonable period, rat's immunity was debilitated by injection of cyclophosphamide (i.p. ); the infection was induced by injecting (i.v.) the prepared suspension of Aspergillus fumigatus spores. Blood samples, lung tissue, lung fluid smears and nasal fluid smears were obtained during the periods before and after injection. Isolation of fungus was carried out by synthetic media; and macro- and micro-characteristics were studied to identify the fungus. Enzyme-linked immunesorbent (ELISA) and LightCycler-based PCR was employed to check the existence of the fungus in blood samples. Results: The results indicated that all methods were unable to diagnose the A. fumigatus on the following day of infection except ELISA method; however, culturing methods varied according to the type of vital samples where lung tissue and lung fluid smears were the best. Moreover, more than half of the samples used in the culturing techniques had negative results. The highest rate of the cases diagnosed by ELISA and polymerase chain reaction (PCR) was recorded during the second week following the infection, and then it declined gradually till the end of the experiment. The molecular methods showed high efficiency followed by ELISA. Conclusions: It could be concluded that the best methods to identify A. fumigatus were molecular methods; however, the early diagnosis requires the enzymatic-immunological methods (ELISA). The current study recommends the integration among all possible techniques whenever the facilities are available. But when only microbiological methods are used, samples should be collected from different organs of the infected hosts. Aspergillus spp. that cause aspergillosis are globally spread in the nature without geographical exceptions. These species of these fungi were isolated from water, air, soil and food even inside and outside the buildings, in highlands and lowlands, in caves and closed or open spaces. These fungi are saprobes which act as decomposers by absorbing nutrients from dead organic matters. Recently, a remarkable increase in aspergillosis is observed that could be due to increased diseased cases, which resulted in a lack of immunity. The latest data indicate that aspergillosis is increasing in intensive care unit patients or even in patients with normal immunity. Additionally, it is considered as the main reason of mortality in children with Acquired Immune Deficiency Syndrome (AIDS) (1, 2). Aspergillus fumigatus is considered as the major cause of invasive aspergillosis, which is responsible for more than 90% of the cases. However, there would be other four species of Aspergillus including A. flavus, A. terreus, A. niger, and A. nidulans (3, 4). The immune system of the animal models excessively used in invasive aspergillosis reduced and curbed using medicinal drugs such as corticosteroids in order to mimic what was imitate humans (5). It was also possible to cause leucopenia by the cyclophosphamide drug. Such methods are suitable to evaluate the pathogenesis of A. fumigatus in the experimental animals (6). Several conventional, immunological and molecular techniques are available to diagnose the fungus that causes aspergillosis in the biological samples; these methods have some advantages and disadvantages. Nature and infection duration are among the most important factors that affect the process of fungi isolation and diagnosis process. The current study aimed to determine the best biological samples that could be used to isolate and identify A. fumigatus that cause aspergillosis in immunesuppressed rats and to find the best method among traditional, ELISA, and molecular methods to diagnose this species of Aspergillus in different biological samples in different periods of time. The design of the current experiment was approved by the department of Botany and Microbiology, Faculty of Science, King Saud University, Riyadh, KSA. Aspergillus fumigatus isolated from the patients with aspergillosis and identified in the laboratory of microbiology, Faculty of Science, King Saud University. This species were deposited in the Fungus Center at Assiut University, Egypt. Samples were cultured on Potato dextrose agar (PDA) (Difco Laboratories, Detroit, Mich.) in Roux flasks at 37°C for five days. To provide conidial suspensions, the grew conidia were suspended in 100 mL of sterile physiological saline (0.1 % peptone) and concentrations of either 2 x 1011 or 2 x 1012 conidia/mL were prepared, accordingly (7). The concentration was checked using thoma of blood hemocytometer. The suspensions were stored at 2°C to 8°C until use. Hundred and fifty male Western Albino rats (weighing 150 to 180 g) were supplied by the Animal Care Unit at Faculty of Pharmacy, King Saud University. Rats were distributed into the cages (12 rats /cage), provided with food and water ad libitum, and kept three days for adaptation during which no mortality or any changes in their behavior or feeding rate was observed. The immune system was suppressed by injecting (i.P) 200 mg/kg cyclophosphamide (6). The control group was received 1mL of saline solution (0.89 % NaCl). To determine the duration of leukopenia, resulting from immunosuppression, leukocytes were counted using the Unopette system (Fisher Scientiﬁc, Hampton, N.H.). All treated rats except the control group each received 1 mL injection of provided suspension of A. fumigatus in the lateral tail vein (8, 9). Blood samples were collected using two methods. The first: after partial anesthesia, 1-2 mL of blood was obtained from orbital sinus using heparinized capillary tubes (Lab Service Surb, Lecc. Italy). The Second: at the time of dissection, animals were sacrificed following general anesthesia, and then 4-5 mL of blood was withdrawn from the heart using a sterilized needle. The process of fungus detection was conducted using different techniques and samples as culture and isolation methods. Nasal fluid samples, lung fluid smear, lung tissue and blood samples were cultured on Sabouraud dextrose agar (SDA, Oxoid, United Kingdom ) and incubated for seven days at 25°C. The characteristics of isolated fungi were evaluated (10, 11). Growth rate, the growth optimum temperature, shape and color of the colonies and reverse color were determined. The microscopic characteristics were studied by light microscope following staining the samples with lactophenol glycerol. These characteristics included hyphae, conidiophore, conidia, vesicle, phialides, and sclertia. LightCycler Fast start DNA master SYBR green Kit (Roche, Germany) was used as detector. The genetic material of the fungus was isolated using Puregene DNA purification system (Qiagen, Germany ). Modification performed following the protocol of Bu. Samples were centrifuged at 12000 g for five minutes after using the appropriate reagents for hemolysis of RBCs and WBCs. Then, 300 µL were added to the sediment and treated with six units of a lytic enzyme. The genetic material concentration was determined using a spectrophotometer where it was stored at -80°C. For the diagnosis process, single real-time PCR assay was used. The thermal recycling program was set as 90°C for 10 minutes; then, the apparatus was adjusted for 45 cycles: 95°C for 10 seconds, 64°C for 5 seconds and 72°C for 10 seconds. Annealing temperature was carried out at 98°C. The process of monitoring and evaluation of the interaction was achieved by quantification (FISH) for the DNA link. It was a complete random design experiment and all of the obtained data were expressed as number and percentage of positive or negative samples of different sources of the body and different diagnostic methods. In the current study, biological samples were collected during the periods before and after induction of the infection with A. fumigatus. One rat from each group was sacrificed in each specified period to check the existence of the fungus in different biological samples. Table 1 shows the number and rate of the samples with positive results for the fungus detection from the nose, lung fluids, lung tissue, and blood samples taken from immunosuppressed and infected rats (The infection with the fungus was induced on the fourth day of the experiment). This table also shows the elapsed period to begin fungus detection in the biological samples and determine the best type of samples for detection. In all types of samples, detection of the fungus from the second day till the fifth day of the infection was non-effective. However, on the seventh day, the fungus was detected in just one of the 11 samples taken from lung fluids. It was the same in terms of blood samples. Meanwhile, nasal fluid smears and lung tissues did not have positive results on that day. After two weeks from induction of infection the fungus was detected in all types of samples with various numbers and rates. In the second week, lung fluid and nasal swabs were the most and the least samples with positive results respectively. Following the second week, all samples exhibited an increase in the number and rate of positive results which continued until the fourth week. Moreover, tissue fluid and blood samples continued till the fifth week. However, the positive results declined in all samples in the sixth week. The highest rate (45 %) of fungus detection was in the lung tissue samples in the fourth week, while blood samples were the least. aAbbreviations: N.S.C, Nasal smear culture; L.S.C, Lung smear culture; B.C, Blood culture; L.T.C, Lung tissue culture; Beg, Beginning time; Ims.T, Immunosuppression time; Inc.T: Inoculation time. The results indicated the possibility of fungus detection only in 9% of the blood samples and swabs of lung fluids on the seventh day from induction, whereas the rate was zero in the samples of lung tissue and nasal swabs. Blood samples were used to detect the fungus when ELISA and Lightcycler, Fast Start DNA master SYBR green 1 kit (Roche, Germany) were used. 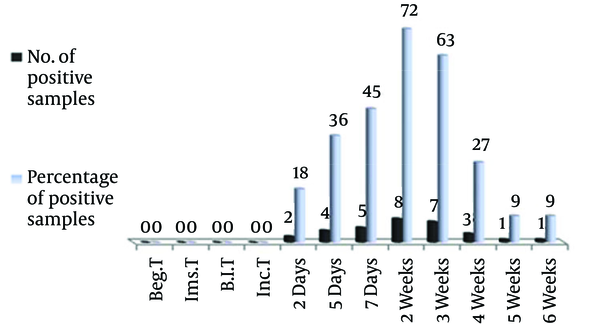 Figure 1 shows the number and rate of blood samples used to detect the fungus by ELISA throughout different time periods before and after the infection induction. Until the first day, detection of the fungus was impossible, however, on the second day two samples (18 %) had positive results. With the passage of time, the number of samples for fungus detection increased to eight (72 %). Following the second week, the number of positive samples gradually declined and reached one sample in the fifth and sixth weeks. Figure 2 shows the number and rate of blood samples for fungus diagnosis by molecular methods, specifically, PCR where the lightCycler, Fast Start DNA master SYBR green 1 kit was used as detector. Results indicated the unavailability of the fungus in blood samples before fungus induction till the second day; however, all blood samples had positive results after the fifth day. The increase in positive samples continued after the fifth day where it reached 10 blood samples (90 %) in the second week, and then it gradually declined to only one sample in the sixth week. Aspergillosis is causing a high mortality rate among the human beings. The accurate diagnosis in biological samples is considered a crucial step presumably not to rely on direct routes or depending mainly upon Microbiological techniques (4, 13). A. fumigatus was the fungus used in the current study where it was mainly considered responsible for Aspergillosis (3, 4). Several studies confirm the difficulty of clinical and surgical diagnosis in several patients suffering from aspergillosis. This led to increase the interest in the laboratory methods to diagnose and identify the fungus in biological samples (14, 15). The results indicated that using synthetic culture media such as PDA to culture biological samples resulted in availability of A. fumigatus detection starting on the seventh day (as in blood samples and swabs of lung fluids), but it was unable to detect the fungus in lung tissue and nasal fluid samples in the same period. Results revealed that the best period for fungus detection in biological samples was during the third and fourth weeks, which were considered too late especially in the diseased cases. Results also showed that the highest available rate of diagnosis by microbiological technique was 45% which means that more than half of the samples had negative results in spite of the presence of fungus within the host body. It was also shown that nature of the sample taken from host body was considered as an effective factor in the diagnosis process. Although blood samples and body fluid swabs exhibited the presence of the fungus compared with the other samples (lung tissue and nasal fluid swabs), the rate of positive samples was so low (9%). It was clearly shown that lung samples were most appropriate when compared with the other types of samples. The current study emphasized that the best methods to diagnose fungus was to take many replicates from different organs of the host body. It should be considered that although these techniques are much easier and less costly with little experience, they require more additional time for incubation period which would be one week, and then the microbiological and microscopic features of the fungus could be studied. This would lessen the dependence on such techniques especially in critical cases. McClenny reported that in spite of using molecular and immunological techniques as quick and best methods to diagnose aspergillosis, the traditional methods which depend on microbiologic and microscopic characteristics remained as major methodologies to let technicians get acquainted with their operational procedures (16). Results of the present study ascertained that the enzymatic immunological methods are suitable to detect fungus causing aspergillosis in immunosuppressed rats. This observation is consistent with those of Patterson et al. and Odabasi et al. who confirmed that ELISA, depending on the detection of galactomannan in the blood samples of leukemia patients, was much more accurate and confident (14, 17). Although ELISA was able to diagnose early infection, however the rate of positive samples was low (18%), and up to the seventh day, more than half of the samples had negative results. However, it reached the highest percentage (72%) during the second week, and then it started to decline until it reached its lowest level in the sixth week. Immunological inspection for the compound 1,3 β-D-glucan was considered complementary to ELISA even though it was generally unspecific to detect fungi infection (17). The molecular methods depending on PCR technique were considered promising applicable methods. 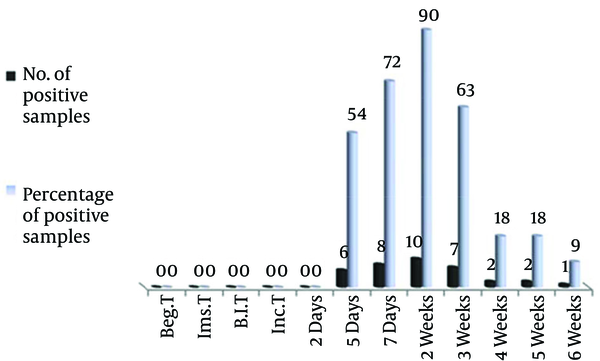 The results indicated that lightCycler-based PCR was highly efficient to diagnose the A. fumigatus in the blood of immunosuppressed rats where more than half of samples had positive results on the fifth day, and in the first week the rate of samples reached 72% and increased to 90% on the second week. The number of positive samples started to decline after the second week, it was also true when ELISA was used; this may indicate that rats started to recover and restored activities of immune system and resisted the fungus till complete recovery. The present study concluded that LightCycler-based PCR is one of the high efficient and effective methods to diagnose A. fumigatus that causes aspergillosis in immunosuppressed rats. However, ELISA is required for an early diagnosis. Although isolation and microbiological techniques are less efficient and require considerable time, they are reliable and could be achieved easily; moreover, it is preferable to take samples from different organs of the host’s body. The current study recommended the application of these combined methods whenever facilities are available to get accurate and ascertained detection. In the case of non-availability of ELISA and PCR techniques it is preferable to use isolation methods for samples of blood, lung fluid, nasal fluids, and lung tissue cultured in appropriate media for identification of fungus causing aspergillosis. The authors wish to gratefully acknowledge their gratitude to the Research Centre, Faculty of Sciences, King Saud University, Riyadh, Saudi Arabia. Authors’ Contributions: Khalid Niazi, Collection of different samples, Isolation of fungi, Collection of blood samples, Detection of the fungi and writing; Jamal M. Khaled, Identification of fungi, Collection of blood samples, Detection of fungus analysis of data, writing; Saleh A. Kandeal, Experimental animals, analysis of Data and writing; Abdulla S. Khalel, Identification of fungi, analysis of data and writing. Funding/Support: This research was financially supported by the Research Centre, College of Science, King Saud University, Riyadh, Saudi Arabia.